This cross platform launcher is just a standalone launcher which can be use by pack authors to create their own Lazy Newb Pack alike pack. Currently, there are 3 packs which include this launcher, one for each supported platform. Please download those if you'd like to use this launcher. First of all: I've contacted LucasUP (the author of the one and only original LNP) about this, and he's fine with me posting this cross platform edition. Second of all: you guys probably don't know me. The obvious reason is that this is my first post topic on this forum . I've been playing Dwarf Fortress for about 2 years now and I've been following these forums during that time as well. Ever since I started using LNP, I wanted to make a cross platform version of it, so when I noticed that LucasUP made LNP open source, I immediately started coding. I started implementing the most basic features and will continue doing the more advanced stuff later, when I think the basic stuff is good enough. 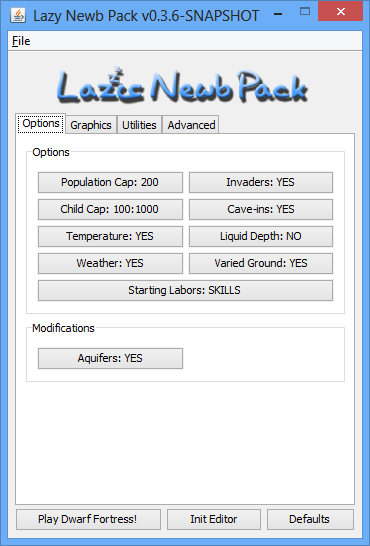 For now I'll be creating a version which is equivalent to the original Windows version of LNP v15 with Dwarf Fortress v0.34.11. After that's done, we can move on to adding more features. I initially posted this in his thread, but I'd really like it if as many people as possible test this beta version, so I've decided to create my own thread. This cross platform version will be open source right off the bat, although at this stage of development I'll probably be a bit less eager to include changes from other developers. Now that I've got a basic version working, I'm very curious to see how it's going to work on other computers than my own one . That's why I'm releasing a beta version right now, hoping that you guys are willing to give it a try and give me some feedback on how it's working. From version 0.5.1, I will only be maintaining the launcher application. For Windows and MacOS, PeridexisErrant and fricy will eventually incorporate this launcher in their packs. We haven't found anyone yet who would like to maintain a Linux pack, so if you feel like doing that, feel free to let us know in this thread. PeridexisErrant and fricy for motivating me to continue working on this again and for being very constructive in their feedback. Opening folders may not work on the Linux version. If it doesn't work for you, upgrading to Java 7 will likely fix it. Fixed the error message reported by fricy. Stopped including utilities in the pack (see the important notice above). 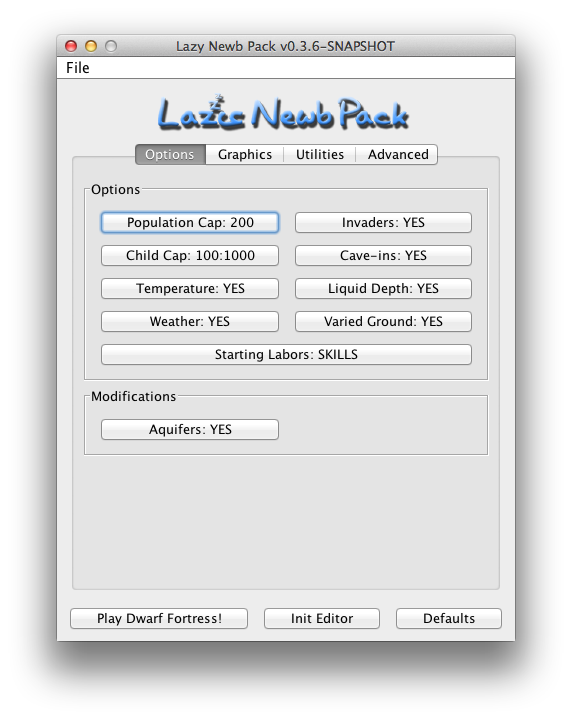 Added the "Reload game and LNP configuration" menu item. 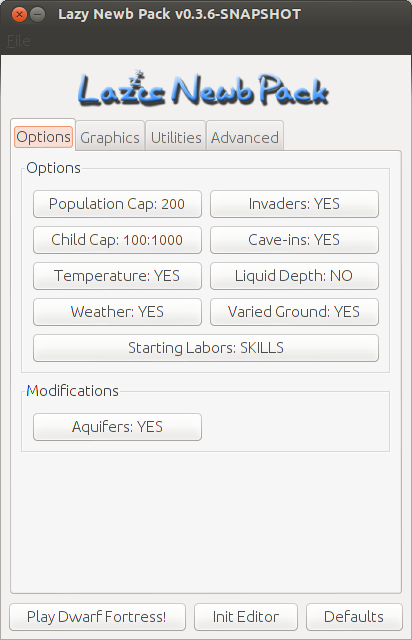 This will reload the game settings and LNP's settings, including utilities, graphics packs and keybinds. This replaces the "Refresh list" buttons in the Graphics and Utilities tabs in LucasUP's original launcher. Changed "Re-save param set" to "Save game configuration". Added the "Open Graphics Folder" menu item. Implemented the Graphics tab, allowing you to install graphics packs. Implemented the Keybinds tab, allowing you to install custom keybinds into DF. Added the ability to start DF with a terminal emulator to make it possible to use DFHack on Linux and MacOS. Added the ability to start utilities with a terminal emulator. Pathnames with spaces in them should fully work now on all platforms. Improved the documentation in the sourcecode. Added a messagebox which will show debug information when an unexpected error occurs. Added the File, Run and Folders menus. Not all menu options are implemented yet though. Implemented the utilities tab (except for the Refresh List button). Added Dwarf Therapist 0.6.12 for all 3 supported platforms. Added SoundSense r41 for all 3 supported platforms. I'm trying to be a bit organized about this, so I've created a board on Trello which I use to track what I've done, what I'm currently working on and what I'm planning to do. On all platforms you will need Java 6 or higher for this version to work. If you don't have Java installed, you can download it at http://www.java.com. This version won't automatically install missing dependencies needed for Dwarf Fortress to run. That's still up to you (for now at least). For the curious and the impatient I've set up a continuous integration service, which creates a new snapshot build every time I push changes to my Bitbucket repository. Fair warning: These builds are not guaranteed to be stable and primarily aimed at pack authors who are eager to test newly imlemented features or bugfixes. The latest snapshot build can be found here. The source code can be viewed and downloaded from the Bitbucket repository. Works on OSX though I can't figure how to get SoundSense to actually play music, it starts up fine but DF music is in the background. Did you download/update the soundpack for SoundSense? The soundpack is not included in the LNP download, because it would make the download about 300Mb. That may not be a problem for those who download it, but it would take me ages to upload . So, just out of curiousity, will this Cross Platform edition supplant the original Windows version of the Lazy Newb Pack? I am wondering because I am about to get back into Dwarf Fortress and I can test this version on Windows 7 64-bit and Windows 8 32-bit, at home. Otherwise, I'll just grab the original LNP. I'd love to help out with testing this beta. I'll try to test anything marked [completed] today. I'll be testing on an 64-bit windows 7 machine. Would you rather have issues created on BitBucket or things brought up over here? I also happen to be an interface designer, if there is any part of the interface you'd like advice on, feel free to shoot me a message. Love the fact the LNP is losing its platform dependency and is coming alive again! I'm not sure about the platform independent java-dependency but that is for the tech folks to fight over in the LNP development thread. Thanks! Either way is fine with me. Maybe Bitbucket is a bit easier for me, because it doesn't require me looking through posts in this thread for bug reports. But I will probably create Bitbucket issues for stuff brought up in this thread anyways. java.lang.IllegalStateException: Error while loading the application settings! Hey Nalbir, thanks for testing! Looks like you started the .jar file (lazy-newbpack-gui-0.4.1.jar. You should start the scriptfile lnp instead. Please let me know if this was the problem and if starting the scriptfile solved it. Everything implemented in the OP seems to work. PTW - it'll be nice when the LNP I maintain is not windows-only. Edit: any chance of working directly toward an equivalent of v16 instead of v15? It would just be nice to avoid the cross-platform edition being behind from the very start - I just don't want to lose automatically launching utilities or try to explain what happened. Double post to pass along a bug report from reddit, on OSX. Ill start beta testing right away. I know almost nothing about coding but i can pass along bug reports. I just took a peak at the source - OK, the dates next to commits - and as a non-programmer it looks like there's been not progress since April 15 - and that graphics support was added April 13, the day after Dricus last posted here. Does anyone know what's happened? Is there a built version with the graphics stuff in it? 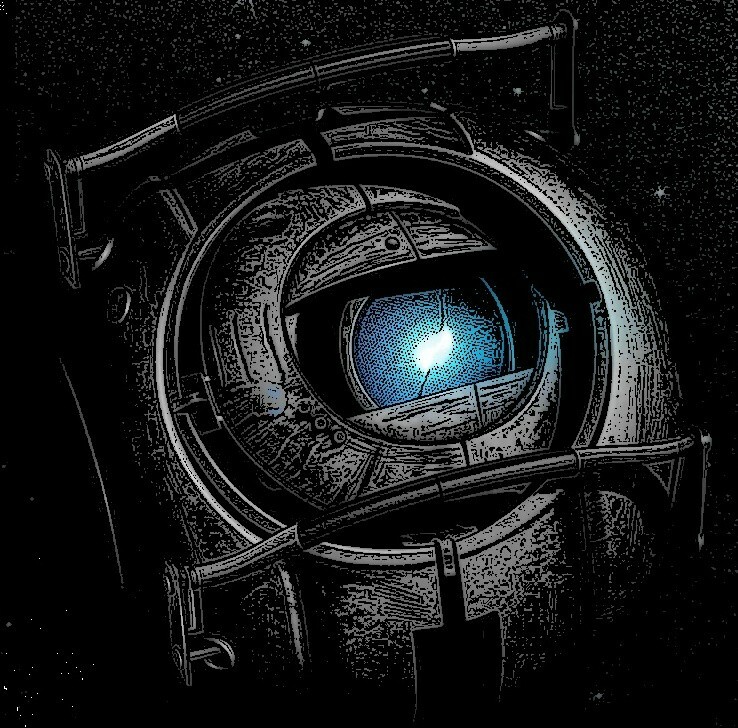 Can someone build one?